The wailing and moaning you’re about to hear on your television and see in your newspaper is the sound of Arizona’s spending lobbies after they read the executive budget released today by Arizona’s new Governor, Doug Ducey. ● The school district bureaucrats who steal money from the students and teachers in our classrooms will loathe the fact that Gov. Ducey’s budget reduces administrative bureaucracy by $113 million (with no cuts to actual classroom spending). ● The corporate crony capitalists will wail about the $100 million slush fund Gov. Ducey wants to take away from the Arizona Commerce Authority. ● The educrats who waste taxpayer money and student tuition dollars at our community colleges and universities will scream about the $84 million in reductions to their budgets. They and their hundreds of lobbyists are going to fight hard to try to stop these cuts. We need Arizona’s taxpayers, producers and consumers to STAND UP NOW and support Gov. Ducey’s budget reforms. Ducey’s budget has more than $660 million in spending reductions for the fiscal year starting July 1 ($360 million is permanent and $304 million is temporary). The permanent reductions will increase to nearly $450 million in the following fiscal year, when – for the first time since the go-go days of the real estate boom – the state budget will actually be structurally balanced. WITH NO TAX INCREASES. We have always had a core of real fiscal conservatives at the Arizona Legislature who believed in balanced budgets and wanted to protect Arizona’s taxpayers, producers and consumers. But for the first time in recent memory, an Arizona governor is actually taking the leadership role of holding the line against the growth of Big Government. Thank you for TAKING ACTION TODAY to fight Big Government in Arizona! Also, if you want to send a personal thank-you note to Governor Ducey, you can find his contact page HERE. In 1986, President Ronald Reagan began a proud tradition of conservative candidates putting pen to paper and pledging to protect taxpayers by promising to oppose and veto any effort to raise taxes. State Senator Al Melvin joined that tradition as a candidate running for Governor of Arizona when he signed the Taxpayer Protection Pledge while on a recent trip to Washington, D.C.
“I want to congratulate State Senator Melvin for taking the Taxpayer Protection Pledge. The people of Arizona have clearly stated what type of leadership they want in Phoenix. 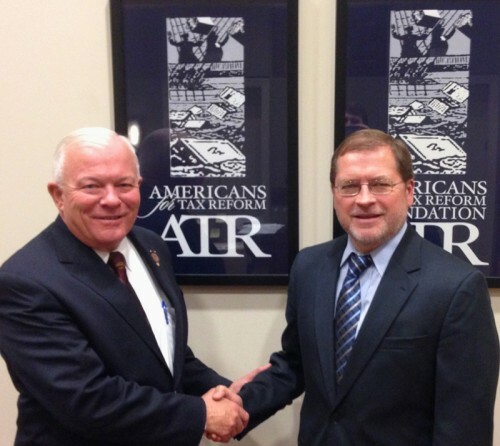 They want leaders who offer real solutions that create jobs, cut government spending, and jumpstart the economy.” said Grover Norquist, president of ATR. The third-term Senator has an ambitious agenda for Arizona that includes the eventual elimination of the state’s income tax. Melvin’s plan, and his conservative voting record, have helped him to attract conservative and Tea Party support from across the state. Melvin serves as Chairman of the Commerce, Energy and Military Committee and founded the highly successful Mining Caucus and Tourism Caucus. He has had a long business career in international trade and transportation and received his MBA degree from Thunderbird School of Global Management in Glendale, AZ. Melvin is a military veteran and graduate of the US Naval War College. As we approach a primary that will decide whether Republicans will field a competitive candidate in this fall’s pivotal election, I wanted to share with you 9 commitments that I am making to Congressional District 9. Too many people get elected to Congress and then seem to immediately forget why they ran for the office in the first place. I’m running to defend life, liberty, and free enterprise. Doing these things will require real spending cuts that will reduce the size of our government. As we work toward these goals, it’s important to recognize that with our bloated federal government currently intruding into so many aspects of our lives, citizens often appeal to their representative in Congress for help navigating the bureaucratic morass. I will work everyday to provide the best possible service to my constituents. My office will be open, friendly and responsive. These nine commitments will guide my actions while in office. As primary day approaches, I hope you will take a few minutes to talk to your friends, neighbors and family in CD 9 about this election. This district could send an Obama-supporting ally of Nancy Pelosi to Congress this fall, but with your help and your vote on August 28th, we can make sure this district is a voice and a vote for freedom. In Congress, Leah will defend our free enterprise system and work to balance the budget. She has been endorsed by Arizona Right to Life, Citizens United Conservative Victory Fund, CatholicVote.org, U.S. Representative Trey Gowdy (R-S.C.), U.S. Representative Sean Duffy (R-WI) and former ASU quarterback Andrew Walter. Congressional District 9 is a new seat that includes all of Tempe and Ahwatukee along with parts of Phoenix, Paradise Valley, Mesa, Scottsdale and Chandler. Leah served for more than a decade around the world as an operations officer for the CIA’s Clandestine Service. She is a graduate of Arizona State University and attended Rhodes Junior High School in Mesa and Seton Catholic High School in Chandler. Leah has four children with her husband, Alfred, a Foreign Service Officer currently serving in Afghanistan with the U.S. Department of State. A lifelong conservative and strong believer in the principles of economic liberty and limited government, Leah will be a voice and vote for freedom in Congress. For more information, please visit www.leahforcongress.com. Will Congressman Jeff Flake Continue Relying on Special Interest Dollars? Phoenix, Arizona – 106 days ago, Wil Cardon asked Congressman Jeff Flake to join him in pledging to put Arizona first. He’s asking that both candidates work to keep this Senate race fair, balanced and without interference from Super PAC’s or third party groups. On June 4th, we learned that the DC special interest group, The Club for Growth, has spent and bundled more than $1 million dollars to help the Jeff Flake for U.S. Senate Campaign. Wil Cardon is calling again on Congressman Flake to stop relying on special interest dollars and sign the Arizona First Pledge. Congressman Flake hasn’t signed the Arizona First Pledge. Phoenix, Arizona – 104 days ago, Wil Cardon asked Congressman Jeff Flake to join him in pledging to put Arizona first. He’s asking that both candidates work to keep this Senate race fair, balanced and without interference from Super PAC’s or third party groups. (Tempe AZ) Lt Col Wendy Rogers has signed the Cut, Cap and Balance Pledge. The pledge was a created by a coalition of over 40 conservative grassroots organizations who are calling on elected officials to support spending cuts and balancing the federal budget. The original bill, which was approved by the House but rejected by the Senate, limited 2012 spending to $82 billion less than current spending levels, and it capped overall federal spending as a percentage of GDP, bringing it to less than 20 percent of GDP by 2017. The bill provided for a debt ceiling increase if and only if Congress sends a constitutional balanced budget amendment to the states for a vote. Cut – Substantial cuts in spending that will reduce the deficit next year and thereafter. Cap – Enforceable spending caps that will put federal spending on a path to a balanced budget. Balance – Congressional passage of a Balanced Budget Amendment to the U.S. Constitution — but only if it includes both a spending limitation and a super-majority for raising taxes, in addition to balancing revenues and expenses. Lt Col Wendy Rogers is a 20-year career veteran of the United States Air Force and was one of the nation’s first female pilots in today’s Air Force. She owns a small business in Tempe with 10 fulltime employees. Lt Col Rogers is running for Congress from where she has lived for the past 15 years in Arizona’s newly created 9th Congressional District, which includes Tempe, and parts of Phoenix, Scottsdale, Mesa and Chandler. Campaign website is www.WendyRogers.org. PHOENIX – Mayoral Candidate Wes Gullett unveiled a bold set of needed reforms to Phoenix’s public pension system today, including a call to begin transitioning city employees to a 401K-style retirement plan in line with the private sector. Phoenix’s public pension system has become an unsustainable and growing burden on taxpayers. Taxpayers spend nearly $100 million a year to cover the unfunded liability of the employee pension program – a price tag that is growing. 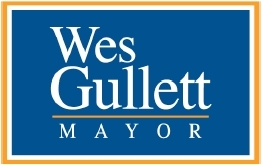 Included in the Gullett plan is the elimination of a deferred compensation plan, commonly known as a second pension, which costs taxpayers $40 million a year – almost enough to cover the cost of repealing the city’s food tax. Gullett has called for the repeal of that tax. Gullett pledged to make pension reform a top priority if elected, stressing that the reforms are necessary to save taxpayers from ever increasing unfunded liabilities and to ensure city employees have a sound retirement plan. The Gullett plan is two-tiered, protecting the pension of current retirees, while making future changes that limit the unfunded liabilities taxpayers will otherwise have to pay for. (Phoenix, AZ) – The Arizona Taxpayer Action Committee is pleased to announce the endorsement of former State Senator, Jim Waring, in the race for Phoenix City Council, District Two. During his service in the Arizona State Senate, Jim Waring earned the title of ‘Champion’ and ‘Friend of the Taxpayer,’ a ranking bestowed by the Arizona Chapter of Americans for Prosperity, the largest grassroots taxpayer educational organization in the State of Arizona. The Arizona Taxpayer’s Action Committee issued this critical endorsement days ahead of thousands of early ballots being mailed to Phoenix voters on Thursday, August 4th. Candidates were asked a variety of questions related to tax rates, types of taxation, city budgeting, unions and the growth of city government. The survey is available online here. “The race for District Two is the epitome of the battle between government unions and taxpayers,” Wikfors said. “We believe Jim Waring represents the interests of taxpayers and will hold special interest government unions in check,” he said. The PAC is expected to make one final endorsements in the race for Phoenix Councils, District 3 and, in the mayoral and council races in Tucson. The Arizona Taxpayer’s Action Committee (ATAC) is the largest taxpayer advocacy political action committee in Arizona. ATAC recently participated in and won a landmark U.S. Supreme Court decision eliminating the matching funds provision of Arizona’s “Clean Election” law. For more information about the Arizona Taxpayer’s Action Committee, please visit www.ArizonaTaxpayerAction.com or email the committee at info@arizonataxpayeraction.com. He has given up all city hall benefits, including the state elected official’s pension that comes with the job. “These are tough times for Phoenicians. People are struggling with loss of income, jobs and even to make their mortgage payments. I have not taken any of the city hall “perks” that come with being a city councilman, and I am making sure Phoenix taxpayers are not paying for a pension for me,” Jeffries said. Since taking office as the appointed replacement for the District 2 council seat vacancy, Councilman Jeffries has declined the health insurance, smart mobile phone and other “perks” normally allocated to each city council member. Since state law does not allow dropping out of the state elected official pension system, Councilman Jeffries has asked the City Manager to provide the bill for the city’s portion of the pension cost for him so he can write a check back to the city treasury. “There’s a lot of follower-ship in politics today. My step is to set the bar for service on a citizens’ council and provide leadership by taking the step to save taxpayer money,” Jeffries emphasized. Councilman Jeffries has already reduced the city council office expenditures by 67% since taking office. He has switched neighborhood meetings to Saturdays, using city fire stations for pancake breakfasts, meeting constituents during their off time. “The pancake breakfasts allow families to come, meet their city hall representatives in their neighborhood, meet other neighbors, and I am doing it with either donations or out of my pocket, not the taxpayer’s money,” the District 2 councilman said. 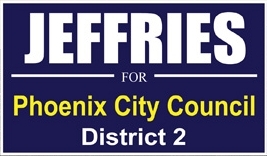 Bryan Jeffries is the only Phoenix City Council member or candidate for Council to give back the perks and pension. I, Bryan Jeffries, as your City Councilman, recognize these are hard times for Phoenicians. People across our city have lost income, jobs, benefits and many are struggling to make their mortgage or rent payments. I am giving back all the “city hall perks” – Phoenix taxpayers will not be paying for an elected official pension, health care, cell phone or other “perks” that Phoenix council members get. I am giving it back because during hard times, it sets the bar of leadership to simply do my part and help out. I am not a career politician and I don’t need the elected official pension benefit. This is supposed to be a citizens’ council. It does not make sense to get more than other citizens have during tough times. Each Council member and candidate has their own decision to make on the perks. This is how I will lead for District 2 neighbors.